With so much flexibility in services, it’s no wonder one-third of U.S. workers are freelancers. But, freelancing doesn’t just let you sell your strengths. It also gives you a chance to make a flexible income. One that lets you work on the projects you want and for clients you choose. Oh, and did I mention, you get to set your own rates? Sounds pretty ideal, right? It is. Or, I should say, it can be. But just like anything unfamiliar, it can be tough to get started. Especially when there’s a lot of information out there. How do you take the first step? What services do you offer for sale? Is it even possible to start a scalable freelance business in your free time? These are all very important questions, and ones that are easily answered. But first things first, you’ve got to figure out where to start. When I started freelancing, I jumped right in. That is, I quit my day job and devoted all my attention to freelancing. For me, this was great motivation. Knowing that I had no income coming in really lit a fire under my bum, so to speak. And to make sure I stayed afloat financially, I gave my all to freelancing. But, I know this doesn’t make sense for everyone. Instead, it’s a lot more realistic to dip your toe into the freelance waters. You know, take it for a test drive before going all in. But this also means you’ll be juggling freelancing with your full-time gig. And, honestly, that can be tough. Impossible? No. Tough? Yes. But, you’re up for the challenge, right? Especially when the payoff is a truly flexible work-from-anywhere career that pays better than that 9-to-5 of yours. 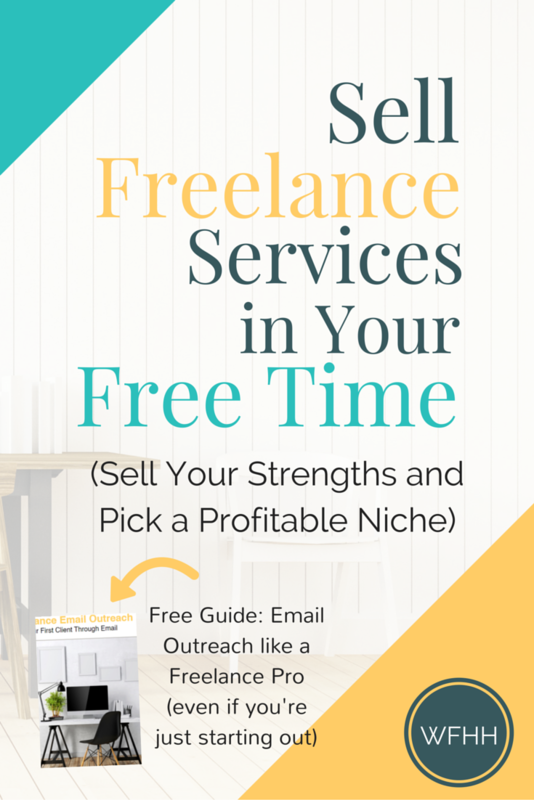 What Freelance Services Will You Sell? First up, know that you’ve already got the right skills to freelance. You just need to pick the most profitable one. Don’t try to sell freelance services that are a stretch for you. That is, simply go with what you know. Remember, you don’t have to be an expert to be a freelancer. You must, however, provide a service that offers value to clients. And the best way to figure out what that is is to first take inventory of your existing skills. The whole point of freelancing in your free time is to put your existing skills to good use. And it also means you should offer things you’re comfortable doing so you can confidently complete client work. So, what skills do you have that can turn into freelance services for sale? Good question! It’s time to take a skills inventory. Without getting too technical, there are a lot of different skills and categories they fall into. But generally speaking, they can fall into two main categories: hard skills and soft skills. Soft skills, on the other hand, are difficult to measure. For example, we can take standardized tests to find out who’s the fastest typist (hard skill). But it would be a lot harder to show who’s the most adaptable (soft skill). Why is knowing the difference between hard skills and soft skills important? The more hard skills you can identify, the better your chances are of matching them up with in-demand freelance services that sell. Does that mean you can’t freelance soft skills? No, of course not. Soft skills often complement hard skills and are important to a successful career as a freelancer. For example, let’s say you want to freelance as a transcriptionist. You’ll play up the fact that you can type 100 WPM with 99% accuracy (hard skills) but also mention you are reliable (soft skill) and always meet deadlines. Similarly, if you are going to freelance as a web designer, you’ll advertise that you’ve got CSS knowledge (hard skill) and are an effective communicator (soft skill) when it comes to making revisions. Or, if you opt to sell freelance services as a social media manager, you might list Hootsuite, Buffer and Tailwind (hard skills) as automation tools you know and also mention that you’re comfortable networking (soft skill) online. See what I mean? Hard skills sell really well and soft skills back them up. Together, they make for a really valuable freelance offering! Remember, only list those things you’re already comfortable doing. If you’ve used Photoshop once or twice, you probably won’t want to include it as a hard skill. Be honest about what you can and can’t do. This isn’t one of those times where the more you know the better off you’ll be. Really, all you need is to identify one profitable skill you can sell as a freelancer. Okay. You’ve got an honest look at your existing skills. Now it’s time to figure out a niche. I’m always preaching the power of a niche here at Work from Home Happiness. Whether you want to be a writer, virtual assistant, proofreader or blogger, you can fast track yourself to success by simply picking a niche. As a reminder, a niche is a narrowly defined (yet profitable) service offering. The narrower your niche when starting out, the better you’ll fare. To get your wheels turning, check out the most in-demand freelance skills on Upwork. If you’ve never heard of Upwork before, it’s the world’s largest freelance marketplace. Clients go to Upwork to post gigs. And freelancers pitch against one another to land them. It really is the mecca of freelance work. You don’t have to sign up at Upwork (not if you don’t want to, anyway). But you should go there for inspiration. Because it’s a giant in the freelance services world, you can take a look around to see what exactly clients are most requesting from freelancers, like you. Anything on this list match up with your hard and soft skills? I’m gonna guess, yes! Which is great because you can bet if these services are in demand on Upwork, they’re generally in demand. And in-demand = sales! But it’s not time to start selling just yet. Now it’s time to narrow down your niche by defining your audience. Let’s say you chose content writer as your broad niche. After all, grammar is one of your hard skills and writing is one of your soft skills. So, you put the two together and, voila, content writer. Great! While it’s easy to say you’ll write anything for anybody, it’s not the best approach. It’s just too broad. Instead, figure out who you want to write for. I’ll use myself as an example. I decided I wanted to be a freelance writer. And I pitched and pitched and pitched some more. And guess what? I didn’t land any work. Not a single gig. You see, I was too generic. My pitches were terribly broad and my potential client base was equally diverse. This meant I spent a lot of time sending out bland pitches to too many clients. And it was all for nothing. Fast forward a month later when I finally decided to focus my content writing. Instead of targeting anybody and everybody, I decided my clients would be lawyers. I have a legal background, so it just made sense to offer content writing services to lawyers. And you know what? Once I knew who my audience was (lawyers), I was able to perfect my pitch. And that’s when I started seeing results. Before I knew it, I had more offers to write than I could keep up with. Soon enough, I was rarely pitching for clients. Instead, they were coming to me by way of referrals. I know it’s counterintuitive to limit yourself to a particular niche and narrowly defined audience. You’re probably thinking, that’s crazy! How can I get any work if my potential audience is so darn small? So, whether you want to freelance on the side or plan to start freelancing full time, do yourself a favor: Pick a niche. Whew. Honestly, those three things keep many a would-be freelancer from getting started. It can be hard to figure out what freelance services sell. It can be harder still to believe that you have valuable skills that people will actually pay for. But you do. Now you’re eager to start selling. After all, the whole point of freelancing in your free time is to make extra money, right? Perhaps start small and scale your freelance business until you can quit your day job and focus full time on freelancing. First things first, you’ve got to approach freelancing in a way that doesn’t interfere with your day job but still offers enough attention so you can grow it into something larger. No problem. In today’s day in age, it shouldn’t come as a surprise that there are a number of places to sell your freelance services. As I touched upon earlier, there are entire marketplaces, like Upwork, that do nothing more than bring together clients in need of services and freelancers who have services to sell. Each site operates a bit differently but the premise is the same: The site acts as the middleman connecting you with clients. You pay a percentage of your earnings each time you land a gig. As with anything, there are a lot of pros and cons to these marketplace sites. Since you want to freelance in your free time, marketplaces might be a good place to jump in. Whether or not you land any gigs, you’ll get a chance to submit a lot of pitches. And the right pitch can make all the difference in how much work you secure as a freelancer. Plus, freelance marketplaces let you login any time you have a free moment, see what gigs are posted and decide whether you want to pitch to any of them. You’re not required to pitch a certain number of times per month and you can decide whether or not to accept any offer to work. Everybody has their own path to freelance success. Some people start out on marketplace sites. Other people choose to set up a freelance services site right out the gate. And others use network marketing to get their name out there. Really, you can use any one or combination of these tactics. It really depends on what you’re looking to get out of your freelance career. As a newbie wanting to freelance in your free time, it’s best to start small and grow organically. You don’t want to stress yourself out by trying to pitch your services on too many platforms at a time. Instead, pick one method of finding work and stick with it for a while. What’s my personal favorite way to land freelance work? Email outreach. If you cringe at the idea of emailing someone out of the blue to see if they might, by chance, be interested in working with you — don’t! It’s not as scary as it may seem. And it can be one of the most effective ways to sell your freelance services to your ideal clients. Have I piqued your curiosity? Sign up for the weekly Happiness Digest below and get my quickstart guide to Freelance Email Outreach. In it, you’ll learn the dos and don’ts of effective email outreach as a freelancer and be one step closer to selling your freelance services in your free time! Thanks for sharing all this information. This is going to be very helpful for freelance hopefuls who are ready to dive in. Your story will especially be helpful – your experience will prevent them from going through that. Passing this along. Have a great week ahead!